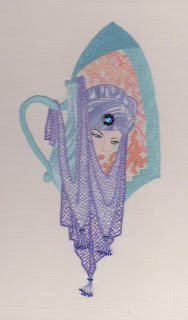 My Embroidery World: A little bit of fantasy! This is "Genie" which I have interpreted in very fine stitching in DMC threads on fine linen. I have called her "Genie" because she looks like she is rising from a bottle or in this instance a jug. The design comes from a kids' colouring page which I found on the internet. Who knows she may grant you a wish! Enjoy!